Exhibiting similar behaviour as a domestic cat, a mountain lion will lay in wait and pounce on its prey. 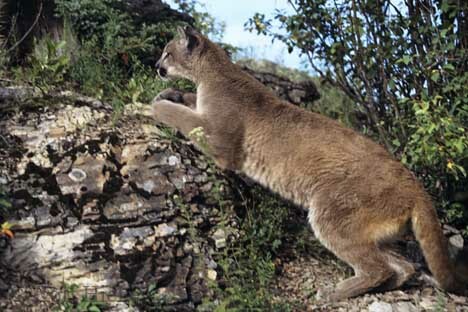 They are known by many names such as puma, and panther, but the most common names are cougar and mountain lion. Although more closely related to the smaller felines and exhibiting similar behaviour, a cougar is in fact the second heaviest cat in North America and fourth heaviest in the world. Cougar, Puma concolor (formerly Felis concolor), British Columbia, Canada. Picture of the predator behaviour of a mountain lion, also known as cougar.